We stepped inside the gate, and began to explore the shell of humanity's worst. I heard the stories and watched the movies about places like that, but sorrow anchored itself in my heart when I treaded upon that very ground. 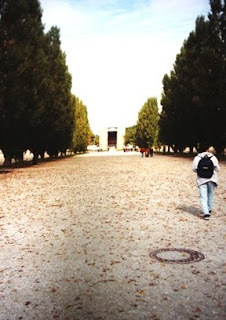 I was twenty one when my classmates and I walked the devastating tour of Dachau, a concentration camp outside Munich. Although it had been 59 years since any prisoner felt the horror, echos of agony bounced off the grey walls of the bunkhouse, the gas chambers, the ovens. The museum at the front of the camp showed photos of the prisoners, their broken spirits, their withering bodies. Only when we left the museum, traveled the silent walk through the middle of the camp, did our solemnity turn to a triumphant twist of hope. Holy tributes built upon that very land: A Protestant church, a Jewish synagogue, an Orthodox chapel, their very presence defying the discrimination against their believers. We found God's comfort in His goodness prevailing over the evil which occurred years ago. My journey through a Nazi concentration camp forever changed my view of this world. It instilled in me a deep compassion for others. 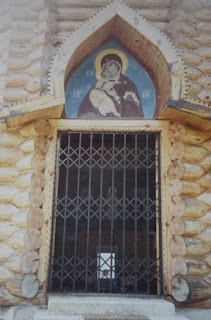 It made the world feel smaller, as I learned how many Greeks (my heritage) were also imprisoned there. 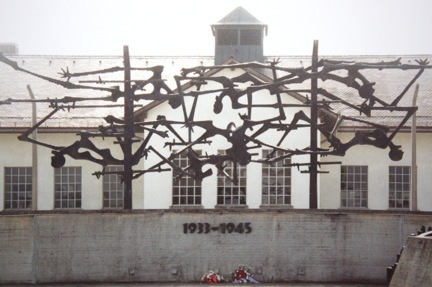 But what I didn't expect from this awakening of my heart, was another, more intimate connection I had with Dachau. where I had traveled that day in Germany, I found out my grandfather was one of the American soldiers who brought freedom to the enslaved at Dachau. He touched the hands of those people in the museum photographs. He stepped into the buildings when the echoes were voices. Perhaps he met a fellow Greek, with hollow cheeks, and horror-filled eyes? Colonel John G. Georgelas, was a living hero, a brave adventurer. I had the pleasure of knowing him into my adult life and hearing his wonderful stories. To find out his part in such a time of turmoil, grew my respect and awe for him and all our men and women who have given up their comfort for our freedom. 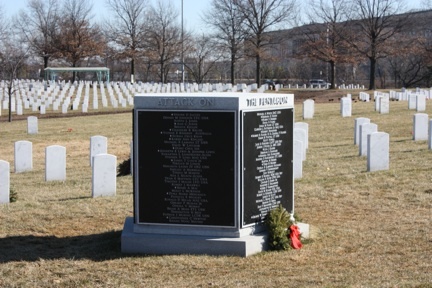 Papou (grandfather in Greek) passed away in 2007 and was buried in Arlington National Cemetery. From his grave, one can see the Pentagon memorial from the September 11th attacks. So many men and women still fight for us, die for us, and face the horror of war. It can't be ignored, it must be remembered. Today is Memorial Day. May we never forget. Amen. A beautiful and poignant post, Angie. Beautiful post, Angie. Thank you! And I love the tribute to your grandfather, it sounds like he was an amazing person. What a beautiful tribute to your grandfather. I can't imagine how life-changing it must have been to enter Dachau. I'm sure your grandfather's journey has shaped the path God has brought you on with your writing. Thanks, Joanne! Cindy- he was an amazing person, and loved by many. Julia, isn't it amazing how God uses things in our lives from long ago, to help shape us for things of today? I look back and see his hand shaping me into who I am today. Wonder what we'll look like after this season is over and we move on to the next?